Moving out and moving up! The balloon has popped and Eddie is free! Free to explore and embark on the adventure he’s always dreamed about. Eddie zooms through the atmosphere and sees the different atoms that make up the air we breathe. His adventure shows him how rare Helium atoms, like his, are. Through his memories, he teaches readers about Helium gas, from its explosive creation to its many uses. As he teaches, Eddie comes to realize that Helium is not only a rapidly disappearing resource, it’s one that is vitally important to our world! Journey with energetic Eddie and learn about his life before being trapped in a grocery store balloon. See how far he has traveled from his home in the Earth’s crust all the way up to outer space, where he looks down on the giant marble called Earth. 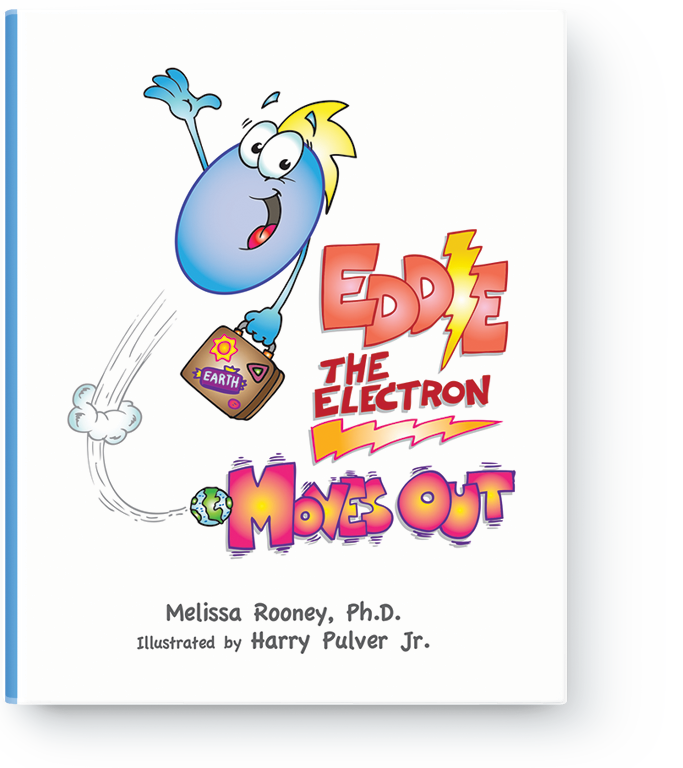 Eddie the Electron Moves Out is the sequel to the exciting and informational book, Eddie the Electron. Students, parents, and teachers will learn how important helium is to our world, while being reintroduced to the science of atoms. Melissa Rooney grew up in Martinsville, VA. After receiving undergraduate degrees in English and Chemistry from the College of William and Mary, she attended graduate school at the University of North Carolina in Chapel Hill, where she studied electrochemistry and was awarded her Ph.D. in Chemistry in 1998. Melissa conducted research in the laboratory of Alan M. Bond at Monash University in Melbourne, Australia, from 1999-2002 and was awarded a Post-Doctoral Fellowship from the Australian Research Council. In 2002, she returned to North Carolina to raise her family with her husband, Mike Rooney. Since moving to Durham, Melissa has been a regular columnist with the Durham News and has written for Highlight’s Children’s Magazine among other serial publications. She is currently a senior scientific editor with American Journal Experts and a teaching artist in the Durham Arts Council’s Creative Arts in Public and Private Schools (CAPS) program, in which she provides engaging, science-based workshops for public schools.